The Royal Australian Navy’s (RAN) second air warfare destroyer, HMAS Brisbane, has completed trials to validate a number of its weapons systems including the Aegis combat system, the service said in a March 27 statement. The Brisbane reportedly conducted an array of different warfare exercises involving the Aegis combat system which is paving the way for further tests of its so-called cooperative engagement capability (CEC), a new wide-area integrated air defense system. The Hobart-class is the first class of Australian surface combatants to be built around the Aegis combat system and the first outside the U.S. Navy to be equipped with CEC. The Brisbane conducted its tests, which also included a component known as the Seaworthy Assurance Trials, over a period of three weeks in open waters. 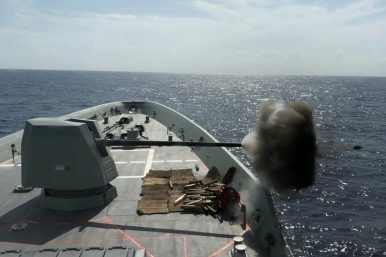 “Once in open waters and with staff from Raytheon Missile Systems USA on board, the ships Close-In Weapons System (CIWS), Bushmaster 25mm Typhoon and main Five-inch gun were all fired to verify their integrity, functionality and accuracy,” the RAN statement reads. The Hobart-class is based on the Navantia-designed Álvaro de Bazán-class frigate (aka F-100) currently in service with the Spanish Navy. The destroyers’ armament includes the Mark 41 Vertical Launching System capable of firing surface-to-air missiles, Harpoon over-the-horizon anti-ship missiles, and light-weight torpedoes, next to a Mark 45 127-millimeter gun. The destroyers can also carry one MH-60R Seahawk anti-submarine warfare helicopter. The keel of Brisbane was laid down in February 2014. The ship was launched in December 2016 and commissioned in October 2018. Total procurement costs are estimated at over[AUS] $8 billion, making this Australia’s most expensive weapons program to date. Approximately half of that amount has been earmarked for major upgrades following the ships’ commissioning. Notably, the Brisbane’s sister ship, the future HMAS Sydney, the final guided-missile destroyer of the Hobart-class, will achieve operational capability 12 months earlier than originally planned, IHS Jane’s reported on March 26.